NFL and College Football tonight!!! Betting is 79% on Texas Tech with the line moving from -28 -106 to -27.5-104. Models again are neutral,variables neutral, public betting favors Kansas. There is a reverse line move favoring kansas tonight however these reverse line moves tend to be more predictive on smaller dogs. Here not only do we have Texas Tech -27.5 but the total is 79.5. Both would make the reverse line move less predictive. So again I am passing on the game. Wednesday we had a 1 unit play along with a 1/2 unit play. The Yankees +130 as a one unit play won 5-3 while Detroit Under 8.5 as a 1/2 unit play lost 6-3. Good Luck Tonight whichever sides your on. Finally a correction in MLB yesterday. The Total on the Detroit game was not a complete game.So the game turned out to be a push rather than a loss. Slightly negative against us most stayed about the same with pitt going against us. First time in awhile that we did not have a predictive day for the movements. Today so far I have sent out 2 one unit plays. Also four big move games. So far also I have sent out two one unit plays in College Football. I’ve really enjoyed reading your blog posts/comments on handicapping methodology—following along has only increased my interest and curiosity for the practice. I’ve recently been more focused on looking at line movements and public betting numbers, etc. (reactive handicapping) to make assumptions, but I realize there are whole subsets of handicappers who rely on predictive stat-based models of team performance projections—e.g. looking at efficiency metrics and then creating a projected “score” for the game, and seeing where Vegas lines are different from his/her projected line. 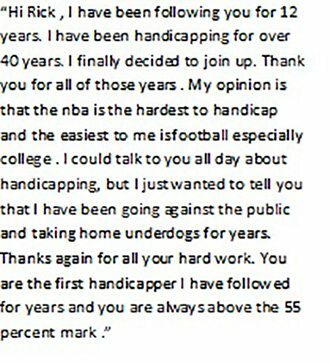 Is your handicapping a mix of both? Or do you lean heavy in one direction? Could one be successful simply playing reverse line movements and exploiting the public? Or, do you have models that you follow, and then you see where yours and Vegas’ differ? I have said many times in the past that the weakest part of my handicapping is the models. All one needs do is go to thepredictiontracker.com and see the many models that cannot produce positive EV consistently. 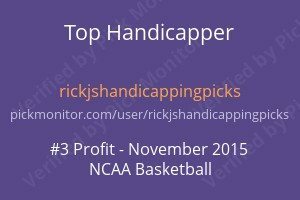 Its one of the best comprehensive sites for evaluating some of the popular modeling that bettors use. I use none of those but have worked on my own modeling over the years. And yet I still would find it tough to turn a profit if that is all I used. But saying that I still incorporate models into my handicapping. 5 to 10 years ago there was no need to. As the public betting was such a good road map that you could count on the books not only predicting which side the public was on but also making sure that the public side was weighted. On top of that you could count on the books moving the lines with the public, sometimes substantially. But all good things come to end and this has. The “sharps” and how the books approach the “public” betting has changed dramatically. Its a rare instance that the books pad a line substantially for the public and even rarer now that the line takes off on the public side of the game. So now models are important to see where the books are weighting the various betting participants. So to answer your question I use a combination of everything at my disposal to find value. Public betting, models and variables are the 3 things I look at. And they change in importance depending on the sport and also what part of the season it is. Handicapping becomes more complex as the years go on. Perhaps its because my mind gets a bit slower:) But more likely its because things are not as clear cut because of the ever increasing “sharp” bettors.